Where's email in your Account Based Marketing Strategy? 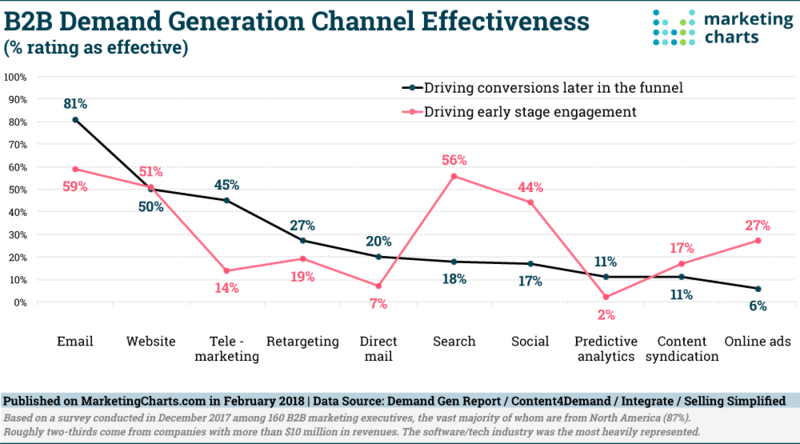 59% of B2B Marketers rate email as effective for driving early stage engagement, 81% say it's effective at driving conversions later in the funnel. Email marketing is one of the most widely adopted and effective channels a B2B marketer can use, yet it's glaringly absent in the best practice we see today. Top 10 lists, ABM jingles and thought leadership presentations, completely vacant. Wow! It produces a ton of "digital exhaust". That is, you can learn a lot about a target account by gauging their interaction with email. It creates a ton of mixed up and confused situations when it's not in sync with your display ads or other ABM communications. This isn't a gripe about marketers. On the contrary. This is a gripe about the general state of what has been declared as ABM best practice. Over the last year and a half, pretty much every marketing automation player has scratched their head and thought that they too should have a stake in this ABM game. After a litany of announcements, only one has passed muster as being a serious contender in this space, Oracle and their ability to augment Eloqua functionality with their recently announced CDP offering, Unity. This is probably out of reach for SMB to mid-tier B2B marketers but their announcement last week about integration with MRP Preltytix changes the game for any Eloqua customer. It's freakishly strange how we can find only one such player in the email market that has a serious idea around ABM. Confounding at best, how can ABM platforms ignore email? OK, a couple of them can deploy email outside of client core systems, but it's by far the exception that any ABM platforms can both gather insight from a clients' email platform and can, in turn, deliver account coordinated messages back through it. Considering ABM? Add email to your purchase requirements! The single best thing you can do at this point is to ask the right questions. We've got your back! Your email platform should be both a source of insights and a channel of delivery in your ABM program. Period. Don't let a sales rep try to convince you otherwise. Why is this important? Don't make it hard for buyers to buy. When you present buyers at target accounts with conflicting and dissimilar messages between channels you make it harder for them to grok what you do and how it can be important for them. When your most reliable channel, email, is a part of your ABM program, you can make the content strategy between channels seamless. This something you can solve today. Make it a priority. It's already hard enough to get your message through to buyers. The AMA estimates people are subject to as much as 10,000 impressions per day... make your messages the ones that leave an impression.